OK, I promised to not be one of those nudges and update on my progress all the time–it’s been almost 2 months since the last update and I am beyond thrilled with the results. So far, I have lost 32 pounds and I can see all sorts of changes. I am still riding the bike when I can–it’s getting cold; but I find that going faster or longer is becoming easier and easier. The days when I don’t ride the bike, I have taken to walking. Usually it is just 2 miles at a brisk pace at night after things have calmed down. I crank up the tunes on my phone and just kick it out. A few times I even walked with 5 pound dumb bells in my hands to exercise. 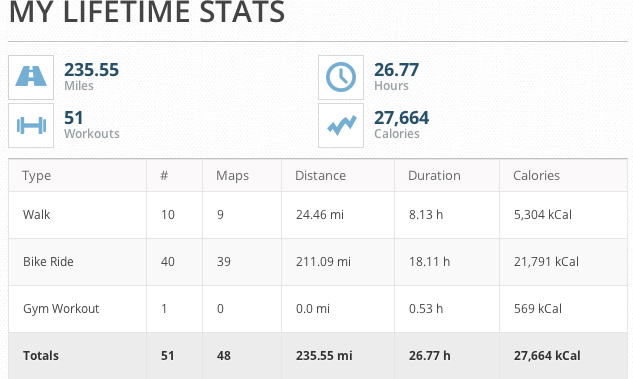 Longest bike ride was 12 miles in just under an hour, and the longest walk was 6 miles in just under 2 hours. For that long walk, I was hanging out while my daughter was at driver’s ed and decided to take a walk partially around the airport–they have a path. And while I abhor running, I am going to consider a 5K in the New Year. I downloaded a free app for my phone a while ago called Map My Fitness and it keeps track of your activity–makes it really easy. I am finding that my mindset has changed. I am looking at calories on labels and thinking smart (boring) when I eat out. I still would give my left arm for a pizza, cheese steak from Philly and the eggs benedict from the local breakfast place; but I am holding out till I really hit a big milestone and will celebrate. I do not think I am gong to hit my 6o pounds by New Years goal as I have been averaging between 3 and 4 pounds a week. So, I might get 50. But it’s always good to have a goal to reach! On Friday, I go in for the procedure on the little magic machine. It is a scale and a magician that tells you all sorts of stuff just by holding onto these two metal poles–body fat, muscle, etc. And that will be 3 full months on the program. The food and supplements are running between $85 and $120 a week, so it is not cheap. But, I have also not been shopping at the grocery nearly as often. Maybe when May rolls around and we head up to the ranch (announcement tomorrow), I can ride the horse instead of the horse riding me! Hopefully my next update will be around New Years and I will be down 50. We shall see, there are a few tough weeks of food temptation in between!